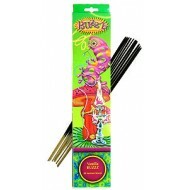 Buzzz Incense offers scents so clean and crisp you can almost feel them tingle. Tingly, sweet incense. You'll wish it was edible. ..
Just plain great incense! .. The fragrance of strawberry with a tingly, effervescent twist! It's like smelling strawberry soda! ..
Incense good enough to smear in your hair. ..